Founded in 1996, Budget and Financial Management Assistance (BFMA) serves 600 disabled and elderly clients in the greater Kansas City area. BFMA serves as a representative payee for these at risk people. Social Security often mandates that an individual have a payee because s/he has a history of inability to handle personal financial affairs which often results in homelessness and unstable, volatile relationships with family and friends. If that individual does not have anyone in his life willing to take on this responsibility, his choices are limited. This is where BFMA steps in to provide payeeship services. Funds are sent directly to BFMA for the benefit of the client. Mentally and physically disabled as well as elderly people rely on BFMA to systematically pay rent in order to keep a roof over their head, to pay utility bills to ensure ongoing service, and to send a check once a week for groceries and personal needs. BFMA not only pays basic bills for clients, but also advocates for them with landlords, utility companies, and creditors. BFMA helps protect disabled clients who are vulnerable and misunderstood from being taken advantage of financially. The mission of BFMA is to foster financial stability as a representative payee through bill payment, budgeting, and advocacy to the elderly, disabled, and homeless in the Kansas City Metropolitan area. 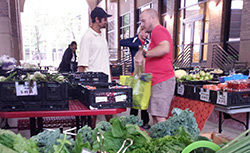 BFMA serves the entire Kansas City metro including Clay, Jackson, Platte, Buchanan, Johnson, and Wyandotte counties. 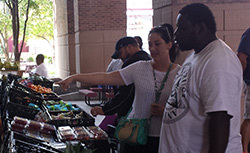 All BFMA clients are low income, with most receiving $733 monthly through SSI. All BFMA clients are disabled. On average, 48% of clients are African American, 47% are Caucasian, 4% are Hispanic and 1% are other. Nearly 60% are male and 40% are female. 2014 statistics indicate 5% of clients are minors, 5% are 18 - 24 years of age, 58% are 25 - 54 years of age, 23% are 55- 64 and 9% are 55 or older. ESL clients are effectively served using a language translation service. Deaf clients are effectively served using TDD relay services. BFMA staff has the ability to work with at-risk behaviors. BFMA serves as a payee bacause there is no responsible or capable party currently involved in the life of the client to provide this service with professionalism, integrity and diligence . At BFMA, we strive to help our clients achieve their basic needs to carry on with their lives and feel as secure as possible. We assist to ensure the most essential needs are met. Securing these vital needs is necessary to set the foundation which will then allow more progress to occur. BFMA provides a unique service for our community. We are diligently working to reduce the occurrence of homelessness in the Greater Kansas City area. BFMA also provides an alternative for family members of clients who do not want the strain of financial responsibility. BFMA clients have disabilities that impact their ability to handle their own financial affairs, but each of them has the ability to attain financial literacy that helps them understand the process and value of budgeting and recognize behaviors that lead to financial woes. 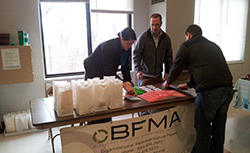 BFMA case workers assist each one individually to establish a budget. Typically, clients manage from month to month without a problem. But difficulties occur if they order too many cable services or start using a credit card. BFMA with grant support has developed materials about budgeting and leasing that are appropriate for people with disabilities and address the concerns of low income people. With these new materials, staff members help people avoid financial mistakes and help them address issues that have led to financial distress in the past. Case workers can be proactive because they have tools to help people who have made a mistake remediate that situation. Setting and meeting budget goals allows the client to work towards something tangible and attainable such as a new TV and builds better decision making skills. To be eligible for a referral, a client must currently have a payee, recently been awarded disability and required to have a payee, or have a physicians letter stating the individual needs a payee. Please call BFMA to discuss the needs of individual clients so we are able to ensure the we can assist with the potential client's needs. A BFMA rep will meet with the client and caseworker at a SSA office to complete BFMA paperwork, and submit the application for BFMA to become the client's payee. Please see Client Info for enrollment forms and additional information. The mission of Budget and Financial Management Assistance is to foster financial stability by providing budgeting, bill payment, and advocacy as a representative payee to disabled, homeless, and elderly persons in the Kansas City metropolitan area. A representative payee is an individual or organization appointed by the Social Security Administration (SSA) to receive Social Security and/or Supplemental Security Income (SSI) benefits for someone who cannot manage, or direct someone else to manage, his or her money. A client is required to have a payee if Social Security, a judge or doctor dictates the individual needs one because they have a history of inability to handle their financial affairs. The main responsibilities of the payee are to use the benefits to pay for the current and foreseeable needs of the beneficiary and properly save any benefits not needed to meet current needs. The payee must provide an account of all income, expenses and savings to the SSA as requested. An organizational payee includes social service agencies, institutions, an official of a State or local government agency, or a financial organization. © BFMA. All right reserved.